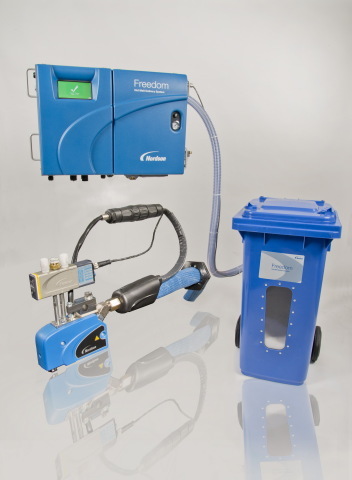 DULUTH, Ga.--(BUSINESS WIRE)-- Nordson Corporation (NAS: NDSN) and Henkel (Dax: HEN.DE), packaging industry leaders in adhesive dispensing equipment and adhesives respectively, announce the commercial launch of the Freedom Solution. The Freedom Integrated Hot Melt Packaging Solution combines Nordson's innovative, tankless Freedom™ Series hot melt dispensing equipment with Henkel's high-performance, Technomelt® Freedom™-certified, family of adhesives to help customers contain costs, simplify operations, and increase productivity, reliability, and sustainability. Freedom from adhesive availability concerns - Technomelt® Freedom-certified, adhesives use readily available polymers that are less affected by petrochemical feed stock demands and shortages than traditional packaging EVA adhesives. Freedom from downtime associated with char and contamination - Tankless melting prevents the adhesive degradation and char that can occur in conventional melter tanks while the excellent temperature stability of Freedom-certified adhesives further reduces char potential. Reduced char minimizes clogged filters, applicators and nozzles as well as the resulting maintenance, downtime and lost production. Freedom from manual adhesive filling - The integrated automatic fill system supplies room-temperature adhesive to the melter, minimizing operator involvement and labor costs while preventing missed adhesive beads from dry melter tanks. Operator exposure to molten adhesive is minimized, as is the potential for bending and lifting injuries associated with manual melter filling. Freedom from parent machine mounting and integration limitations - Unlike traditional cube-shaped melters, the Freedom melter saves space using a vertical footprint that also allows it to be mounted almost anywhere within parent machinery, on a wall or on available fixed or moveable mounting stands. Freedom from confusing controls and diagnostics - Simple, intuitive, touch-screen minimizes the need for skilled operators and training. Diagnostic, alert and fault messages are displayed in simple text and in a choice of languages. Freedom from excessive adhesive use - Improved adhesive density reduces adhesive consumption while intermittent bead dispensing capability enables up to 50-percent less adhesive use. Waste associated with manual spilling and overfilling is also minimized. "The Freedom system is more than a new generation in package sealing," said Peter Lambert, Senior Vice President, Adhesive Dispensing Systems at Nordson. "Our goal was to reduce packaging costs and complexity for users. We looked beyond conventional hot melt systems and approached the adhesive dispensing process from the users' perspective. From the automatic filling system all the way to dispensing applicators and nozzles, we studied and improved everything, continually removing traditional limitations and areas that affect end users time and operating costs. We are confident that we have succeeded in providing an integrated system that will pay for itself quickly and keep saving customers money over the life of the equipment," said Lambert. The Freedom System launch is the culmination of extensive voice of customer research and rigorous equipment and adhesive performance testing at customer locations in the U.S. and Europe and is a result of the Henkel and Nordson alliance first announced at the PackExpo tradeshow in October 2012. For more information on Freedom system, contact Nordson Corporation at (800) 683-2314 or visit www.freedomhotmelt.com. Nordson Corporation delivers precision technology solutions that help customers increase speed, productivity and up-time, enable new products and features, and decrease material usage. The company engineers, manufactures and markets differentiated products and systems used for dispensing and processing adhesives, plastics, coatings, sealants, biomaterials and other materials, fluid management, testing and inspection, and UV curing and surface plasma treatment, all supported by application expertise and direct global sales and service. Nordson serves a wide variety of consumer non-durable, durable and technology end markets including packaging, nonwovens, electronics, medical, appliances, energy, transportation, building and construction, and general product assembly and finishing. Founded in 1954 and headquartered in Westlake, Ohio, the company has operations and support offices in more than 30 countries. Visit Nordson at www.nordson.com, twitter.com/Nordson_Corp, or Facebook.com/Nordson. The article Innovative New Freedom™ Integrated Hot Melt Packaging Solution Delivers Strong Return on Investment and Reduces Packaging Costs originally appeared on Fool.com.